Members of the Sussex Riptide team pose with officers from the Ocean View Police Department at a pre-competition bicycle regatta at police headquarters last week. 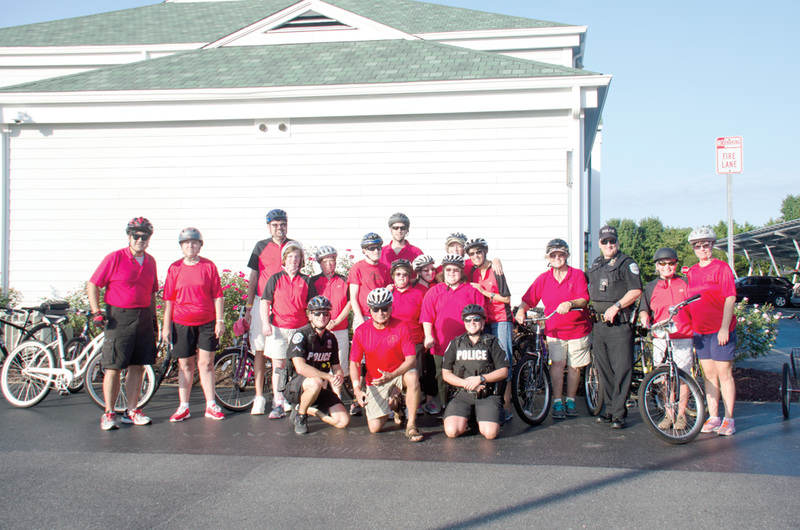 The athletes arrive at the police station with their bikes, shirts and helmets, and go on a ride through the neighboring community of Bear Trap Dunes, accompanied by Ocean View officers on bicycles, a patrol car and the department’s ATV, driven by Chief Ken McLaughlin. Eastern Sussex County Special Olympics athletes who are part of the Sussex Riptide team attended the event, led by coaches Adam Rones and Tony Gough. “It’s always a good group. It’s a social activity as much as anything else ... bonding year-round,” said Rones. The athletes train at the Delaware National Guard site near Bethany Beach, which they said has been a blessing to the group. “We don’t have to worry about our athletes’ safety because it’s on the base,” said Linda Bak, who’s been involved in Special Olympics Delaware (SODE) with her daughter Carol for 44 years. Bak said Special Olympics has touched the lives of so many, and has helped its athletes. “It has given her confidence she never had before,” said she of her daughter. “She’s played all kinds of sports we never thought she would be able to do. Special Olympics is a large family. Everyone is friends. A lot of the people here Carol has known since she was little. Bak said the impact doesn’t stop with the athletes, as SODE has also touched the lives of the athletes’ families. “It’s nice to be able to associate with people who know what kind of problems you have, and sometimes they’re having the same kinds of problems, and you can see how different people solve the problem. Maybe they have something that works for you; maybe you have something that works for them. People understand how you’re feeling… That’s a really good thing about it. As for the annual bicycle regatta, the athletes look forward to the ride. “It’s like the recreational race before the competitive event,” Rones said. “They love it” — especially the pizza. “We get to have fun,” said Riptide athlete Justin Daisey, who has cycled for more than a decade. “Go Riptide!” said athlete Andrea Koehler. Athletes in Delaware are welcome to participate in 20 sports, with training and competitions held across the state throughout the year. Despite riding for five years, Katie Bowers hasn’t competed at Dover, until now. She was feeling nervous and excited, but she encouraged anyone with intellectual disabilities to try Special Olympics. Bowers herself does about six sports. “It’s kind of neat, because they all know about the Dover race. ... When they get up there, they have a totally different attitude,” Rones said. The athletes have their game faces on, but they completely support each other. The gold-medalists get just as much applause as the last cyclists. The Special Olympians raved about how much they love the cycling program because of the fun and friendships made. “I love it. It’s very good exercise,” said Carol Bak, who has loved bicycles since she started riding at 8. This year, she will compete in the 500-meter and 1-kilometer rides. Gretchen Cooper is very aware of the health benefits. “My doctor told me I was on the verge of diabetes. I needed to bring my sugar down, bring my cholesterol down,” said Cooper, who has been cycling with Special Olympics for three years. “Most of our guys would’ve been sitting around at home if it wasn’t for Special Olympics. Instead they’re out accomplishing things, earning medals, competing in a bunch of different sports. It’s just a fabulous organization,” added Linda Bak. The athletes and their parents complimented the coaches, all of whom volunteer their time. “They’re awesome. They’re really fun to be with,” said Katie Bowers. Bak noted that the OVPD is supportive of Sussex Riptide in a variety of ways — from hosting holiday parties to giving athletes a police ride-along experience. “They also have a program to get athletes aware of police as friends, as someone they can approach if they have a problem. We had several of our athletes participate. “They came and got a tour of the police station. They even took them in the back and showed them a cell. Then they took them a ride in a police car around the neighborhood. They turned the lights on and showed them the cameras inside the car, the way everything is set up,” she said, praising OFC Brian Caselli, who gave the athletes the tour. She said many of the athletes know the officers’ names and will approach them, and often times give them hugs. “The police have a really good relationship with Special Olympics,” Bak said. Dalton was joined by Caselli, who stayed after his shift to cycle through Bear Trap with the athletes. Dalton said this was the second year that the Ocean View officers joined the athletes on bikes. The partnership with Special Olympics is one of many examples of community policing within the department. Officers from the department stop in at Lord Baltimore Elementary School at least once a day when school is in session. They also make routine business checks and have a senior check-in program. The bike-patrol program, which was an idea Dalton brought to McLaughlin, allows officers to get out on their bikes to see and interact with residents in a different way. Dalton said she and Caselli look forward to increasing their bike patrols in the fall. For more information on Special Olympics Delaware, visit www.sode.org.